Ajudy Moody Salva El Planeta! 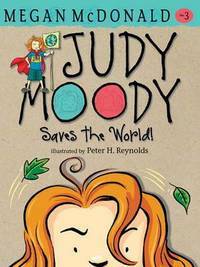 Judy Moody did not set out to save the world. She set out to win a contest. It all started with the Crazy-Strip contest -- and the dream that she, Judy Moody, might one day see her very own adhesive-bandage design covering the scraped knees of thousands. But when her "Heal the World" motif merits only an honorable mention, Judy Moody realizes it's time to set her sights on something bigger. Class 3T is studying the environment, and Judy is amazed to learn about the destruction of the rain forest, the endangered species (not) in her own backyard, and her own family's crummy recycling habits. Now she's in a mood to whip the planet into shape -- or her name isn't Judy Monarch Moody! Megan McDonald is the creator of the popular and award-winning Judy Moody and Stink series. She is also the author of two Sisters Club stories and many other books for children. She lives in Sebastopol, California. Peter H. Reynolds is the illustrator of the Judy Moody and Stink books and the author-illustrator of THE DOT, ISH, SO FEW OF ME, THE NORTH STAR, and ROSE'S GARDEN. He lives in Dedham, Massachusetts.